Bluegrass Pundit: Several hundred Iraqi Christians at WH chant: “Obama, Obama, where are you?" Several hundred Iraqi Christians at WH chant: “Obama, Obama, where are you?" Why he is on the golf course of course. 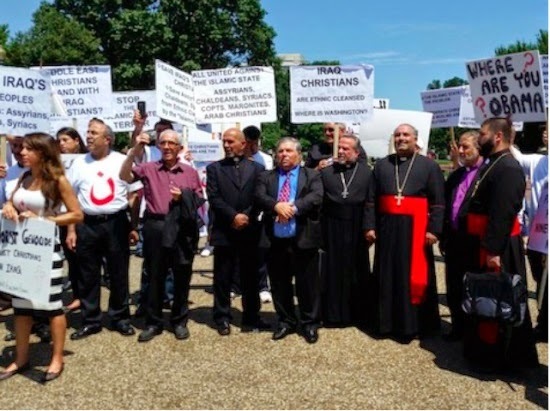 Iraqi Christians held demonstrations in a number of cities on Saturday, including Washington, Paris, The Hague, Cologne, and London, in order to bring attention to the current assault on Christians by the Islamic State (IS)– formerly the Islamic State of Iraq and al-Sham (ISIS) jihadists. One week ago, Christians were forced out of Mosul, Iraq’s second largest city, and many Christian monasteries, shrines and churches have since been destroyed.